“Murder is written into your life at the very beginning.” I thought this was an incredibly intriguing thought. 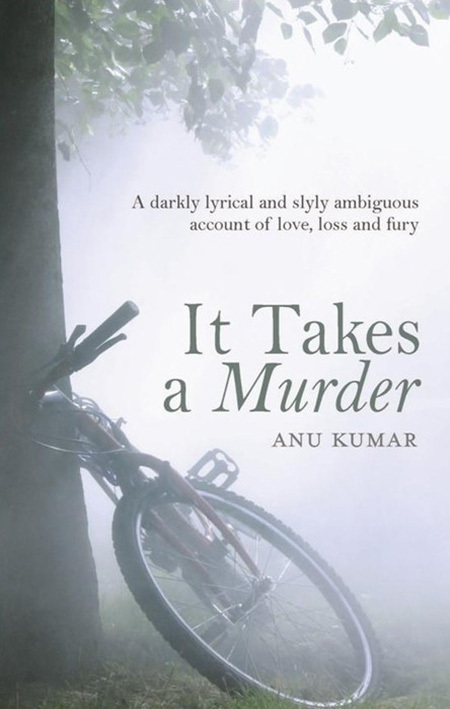 For It Takes a Murder, did you start off with this in mind, or did it occur to you as you developed the plot? It happened at the very end, actually. It kind of wrote itself after I had finished it. Was it challenging to piece together a non-linear story? Tell us a little about how the plot evolved. It’s always difficult to look back on how a story developed. I had these images in mind, most particularly that of a lone woman walking along the river. I never knew her name or spoke to her, but like all silent, nameless people, she had a story, or maybe several. And then there were all these other stories, and how a death affected all these stories, some beginning a long way ago and some in the future ahead. I had the outline, and a basic draft in place as long as five years ago, and then tinkered with it, pulling off bits here, adding portions somewhere else, and this is how it turned out. How exciting was it to invent a completely fictitious hill station in India? You’ve moved around yourself quite a lot. Do you think you attributed qualities from these places to Brooks Town? There is actually a Brooks Town, though it not really called that (smiles). But I can’t quite get myself to name it, because I do want it to remain sort of fictitious. A perceptive friend did come close but there it is, an everywhere hill station quite like the strange woman who lived her two half-lives in it. It was a funny kind of place, this real Brooks Town. And maybe it isn’t at all like I have described, some of what it made me feel added to the atmosphere. But it was somehow right in the centre of the country, a place that could get hot in summer and cold in winters; where the river ran dry and then still could flood over in the monsoons. The flight from Delhi to Singapore flies directly over it, I realised much later, and yes, those are just the two places I’ve moved around in. So many of us do that these days, really. What is the sort of research that goes into writing a book for you? Besides the external research, is there also a lot of introspection involved? For my historical fiction and other nonfiction work, yes, of course there’s some research [involved]. But for this book, for the time span it was set in, I had to look up past events accurately. For instance, a plane was hijacked in March of 1971, there were riots in Calcutta in 1950, people scattered in Iran in the wake of the Islamic revolution of the late 1970s, and what happened in places like Brooks Town when the news of Indira Gandhi’s assassination broke. The introspection bit: if you mean working on developing the characters, then yes, I had to sort of work on having them fully shaped and formed, with a convincing past and believable motivations for doing what they did or are doing in It Takes a Murder. How do you consolidate the research involved in writing a book along with the creative output? What are the challenges you faced? Am still learning how to do it. Of course, I am a huge fan of Amitav Ghosh’s work. The trick is to blend it into the story, like a backdrop, or make it suggest how much an event has shaped a character. It’s too easy to have characters spout nonfiction bits or to have it like some long-winded preliminary, so yes, it does take some working on. And will always, I guess. Against the backdrop of the mist-shrouded, sleepy hill station of Brooks Town, there is the contrasting tone of Charlotte Hyde that is murky and brooding. What was it like putting the two together? She is somehow a part of Brooks Town. I couldn’t imagine her in any other place, really. There is a certain deceptiveness to everything, just as it is with Brooks Town, which is suddenly flooded over one season without anyone expecting it. And then it is peopled by all these people from everywhere else, so Brooks Town is a character in itself, shaping—and in turn being shaped by—those who lived in it. What are you currently reading that has you hooked? Who are the authors that captivate you the most with their storytelling? Would you say there are certain works that influence or inspire your own? At this point in time, I am reading Ha Jin’s Nanjing Requiem. It is set in 1937 as the Japanese forces march into the city. It’s a period I’ve read a bit about, and everything I have read so far has been quite hard to take in. I really like Marilynne Robinson for the breathtaking beauty of her sentences, J. M. Coetzee for making the reader think through the most discomfiting of questions, and Amitav Ghosh for his many wonderful books and essays. Good storytellers I’ve loved reading are too many: Muriel Spark, Graham Greene, Pramoedya Ananta Toer, Andre Brink, R. K. Narayan, Anita Desai, Haruki Murakami—if I dont stop, I will have covered all the continents, I am sure (smiles). Are you working on anything right now? Any new releases on the horizon? There’s a work of detective fiction, Inspector Angre and the Pizza Delivery Boy set in Mumbai, a collection of essays on the early history of the railways in India, and a historical fiction work for younger readers set in Chola times. Most of all, though, I quite enjoy writing Facebook love poems: I have a sort of captive audience for that and then I get feedback too—it’s all very kind, but then it’s instant as well. 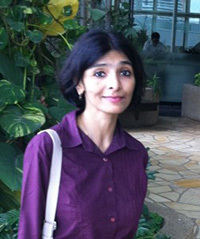 Click here to read our August 2010 interview with Anuradha Kumar.